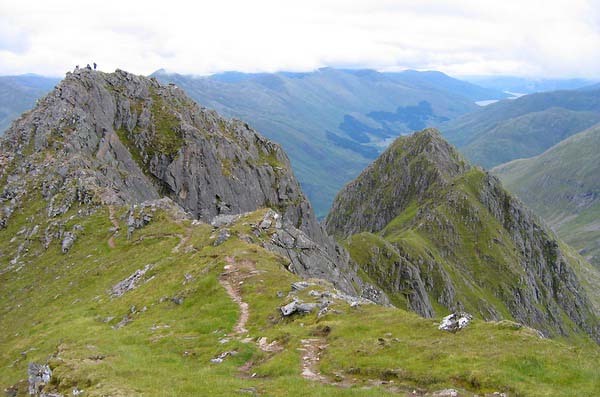 The Saddle and Sgurr na Sgine are located on the S side of Glen Shiel, to the W of the famous South Glen Shiel Ridge. 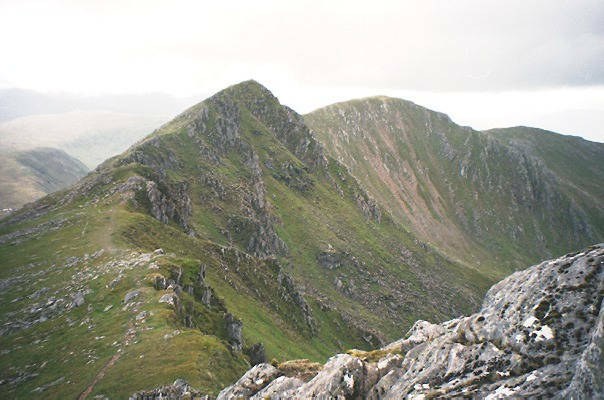 The Saddle is best known for, the Forcan Ridge, its NE ridge down to Meallan Odhar (610m), which offers a splendid scramble on a narrow crest. Consequently the normal ascent route is by path onto Meallan Odhar. If you wish to avoid the ridge, bear SW to Beallach Coire Mhalagain and then climb NW to the summit avoiding the steepest slope ahead. The Saddle is one peak on a long ridge which bears W then curves N around Coire Uaine offering a longer route to the bealach S of Sgurr Mhic Bharraich where a path returns to Shiel Bridge. Crags on or near ascent routes. Scrambling (major), greater exposure and steeper rock. 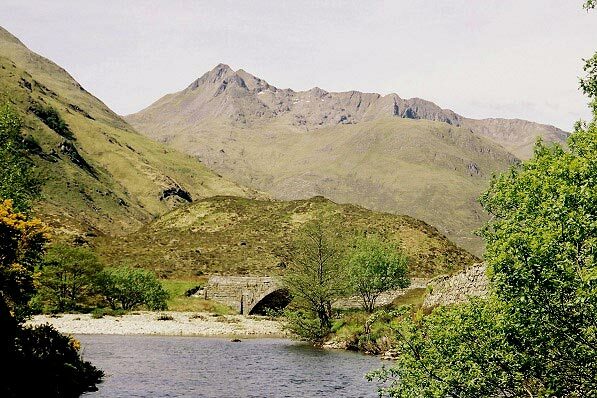 The Saddle seen from the old road bridge over the River Shiel. Craggy Spidean Dhomhuill Bhric contrasting with the red screes of Sgurr Leac nan Each, as the ridge swings north-west. Seen from below The Saddle west top. 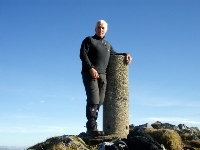 The summary information of one or more ascent routes that include The Saddle. 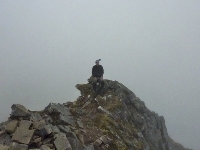 1 1508 m 12.28 km 5.5 hrs The Saddle and Sgurr na Sgine Difficult route due to scramble on rocky Forcan Ridge. A classic South Glen Shiel route. Calum contemplating the Forcan ridge and the saddle from the col at the top of the stalkers path. Post a few words about The Saddle or read what others have had to say. Showing the most recent 5 of 6 comments. Would you like to view all 6? 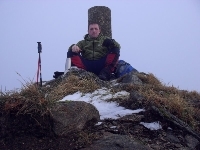 Recently did The Saddle via the Forcan ridge for my 100th Munro and found it every bit as challenging as the more celebrated Aonach Eagach. At ~700m there's a spectacular "reveal" of the rocky fin that stands between you and Sgurr na Forcan - thereafter the ridge is committing, relentless and exposed. The scrambling tested some of our technical skills including crawling and straddling! It didn't help that the NW (right) side of the ridge was under ice, which took most bypass paths out of commission - except, thankfully, the one that avoids a sheer 20m downclimb. All in all, an awesome route. 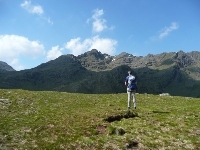 There is an excellent track which leaves the main Saddle ascent track where it starts the approach to the foot of the Forcan ridge by taking a right turn. If you take the fainter track straight ahead, this contours around the base of the Forcan ridge immediately above a dry stone wall to arrive about 50m below the Bealach Coire Mhalagain. (Visible on Paul Richardson's view from Faochag.) I used this as a descent route after spending time exploring The Saddle rather than bagging Sgurr na Sgine at that trip, so plan to use it as an ascent route for a future walk starting with Sgurr na Sgine. Did the forcan ridge today, fabulous climb! The Forcan ridge, 3rd time lucky. Gave up 1st time due to excessive west coast weather. Commiserated in the Clunnie Inn. Tried again in winter, different kettle of fish. Only had my ice axe, would have been happier with crampons, still, made it to the top and returned the same way. Went through 20 Regal King size and most of my vocabulary of 4 letter words, lovely views of my boots in both directions. Not reccomended for the faint hearted, celebrated in the Clunnie again. 3rd time lucky, had another go in summer, great weather, great views well worth the effort. Celebrated at the top this time. I set out to do the standard walk of Saddle/Sgurr na Sgine, ascending the (very fine) Forcan ridge to the summit (not easy to be sure which of 2 tops that is, the first - more easterly, or the second with trig point). But being a ridge-walker more than a Munro-bagger, the prospect of the western ridge to Spidean Dhomhuill Bhric was irresistible compared to that of the dull-looking descent to the col and reascent of Sgurr na Signe as viewed from The Saddle, so did the full ridge, then returned to trig point and descended via the 'alternative ascent' track below Forcan ridge. Superb day out.